Cybersecurity is the most important emerging technology for businesses globally, according to GlobalData, a leading data and analytics company. 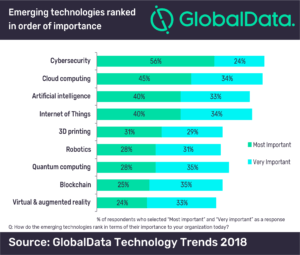 The company’s latest report, Global Emerging Technology Trends Survey 2018, based on a survey of more than 1,500 companies, states that cybersecurity was identified as the most important emerging technology by more than half of all respondents, putting it ahead of areas such as cloud computing, artificial intelligence (AI) and the Internet of Things (IoT). Ed Thomas, Technology Thematic Analyst at GlobalData, says: “Cybersecurity is an investment priority for enterprises from all industries, highlighting its emergence as a critical business function in today’s digital economy. GlobalData’s report also finds that companies worldwide are growing their emerging technology investments. The survey data suggests that businesses from across the world are planning to make major investments in areas like cybersecurity, AI, and IoT. While cybersecurity was seen as the most important emerging technology, GlobalData’s survey revealed that enterprises are not limiting themselves when it comes to investing in the latest technology areas. – GlobalData received responses to its web-based survey from more than 1,500 top level executives and influential business leaders from organizations across 44 countries.